Today we said our formal goodbyes to this amazing part of our country. Through it’s majesty, we experienced its magic. In its presence we felt peace. With its life we relived our own and we emerge renewed and reborn in our own ways. These redwoods…here…truly IS where God lives. We hiked about 2-3 miles today in a grove I’d never before visited. I have been blessed to not only have the best travel buddy (and my daughter’s dearest friend), Jenni, with me to hike trails I’d not gone before in not only in my redwood adventure but where I’d not been able to go in my healing process by speaking openly about Ava. The whole week has been cathartic on many levels. Here are photos from today’s adventure. We decided to start our day at The Chart Room after reading their menu online last night. We’d enjoyed our seafood dinner there a few nights ago and it had a view of the bay. This morning, it was action packed with boats, seals, seagulls and great views. 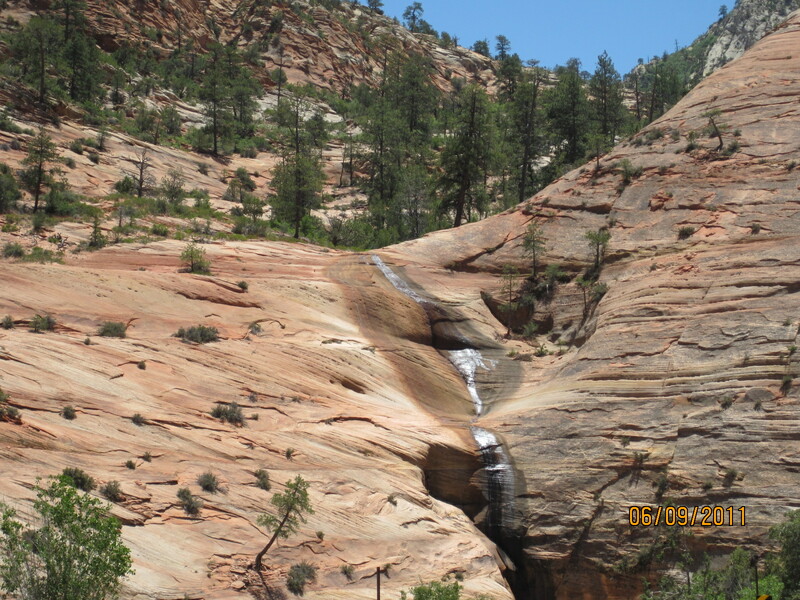 We hiked the Leiffer Grove trail and the Ellsworth Grove trail that branched off from Leiffer. It was , for me, at least, challenging because a great deal of it was some tricky up hill hiking with exposed roots, twists, turns low limbs coupled with great views you didn’t want to miss. What do you see in the burl? I see a lion’s head. This gives you perspective…Jenni with her trusty companion, Boo. He and Montana are best friends! Montana was just over the whole hiking thing at this point and glad for the rest. She was ready to be in the car with the comforts of her bed, water and a chew bone. Tomorrow, we head back toward the desert and 111 degrees. It was one of those spontaneous ideas which happened when we missed the turn in the road. It was then that I realized we were just minutes from the Oregon Coast which Jenni had never seen and I hadn’t seen in twenty years! It was an indicator of how this whole trip has been for us…we’re true compatible travel buddies! When I asked, “Have you ever seen the Oregon Coast?” and her reply was that she hadn’t, I knew then we needed to just do it so we did! It’s only a few minutes north on Hwy. 101 to get to Harris Beach where Jenni climbed rocks with her pup and Montana and I walked the beach. If you know me, you know I love the beach, ocean, trees, rocks and art…especially Mother Nature’s! Here it is! One stop shopping at Harris Beach, Oregon. The best art is Mother Nature’s! I couldn’t make a 3-D picture of this but wish I could have. If you go to this beach, look for this work showing the redwood rising out of the sand like a Sperm Whale and the huge blocks, intricately balanced, which reminds me of the break in the water as the whale surfaces for air! And, although these next pictures aren’t from Oregon, they are from a deep forest off road drive we took not far from there. Here again, it was tough getting a good shot of this moss covered mystical tree. 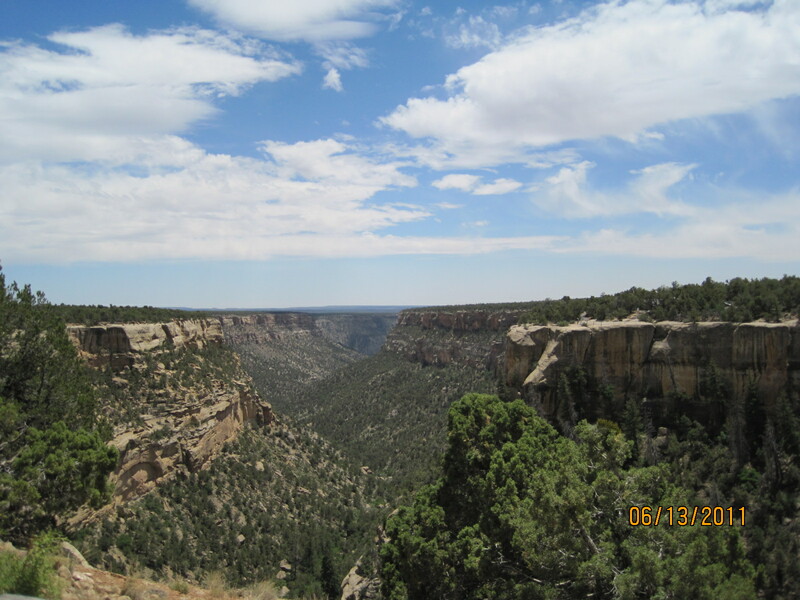 It definitely takes two whole days to see Mesa Verde National Park the right way especially for the two of us. 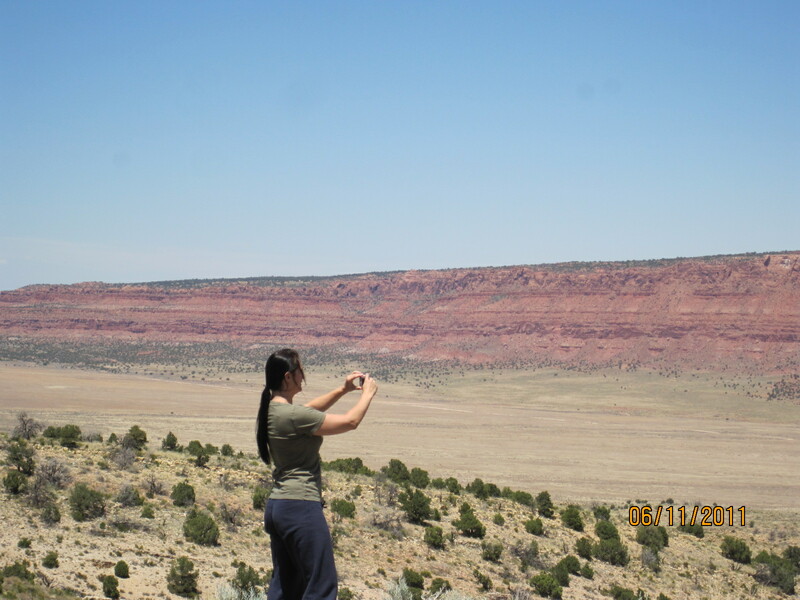 Ava took three of the more difficult Ranger guided tours of the Ancestral Puebloan ruins where you hike down the canyon, across the base of the canyon and up ladders into the ruins. 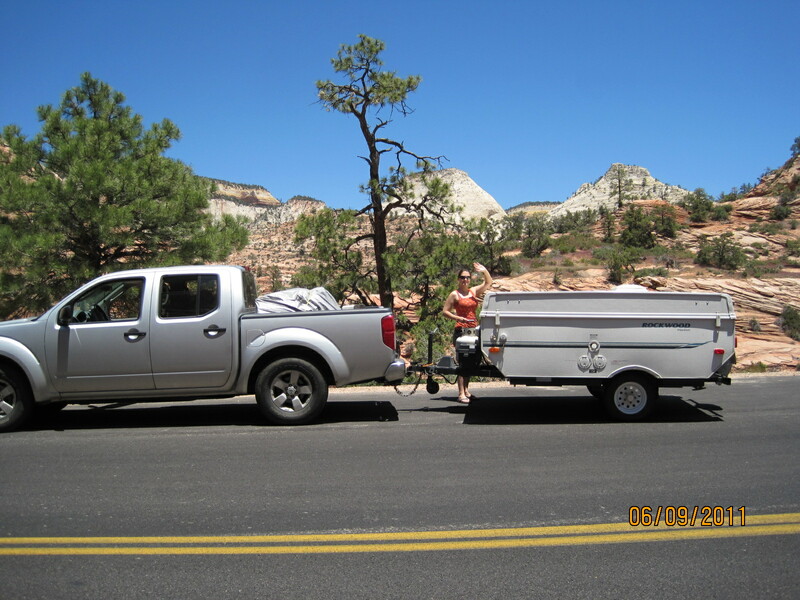 While I, on the other hand, took the easier tours via Silver (my truck) because most National Parks are not pet friendly which means Montana would have to stay in the car or the camper while I hiked. I would only hike short trails if I could find good shade before it got too hot in the afternoon. Needless to say, Montana and I spent a great deal of time in the only areas she was allowed: campgrounds and parking lots. While Ava visited was Cliff Palace, Montana and I drove around Cliff Palace Loop and Mesa Top Loop to scout out the other ruins for Ava. 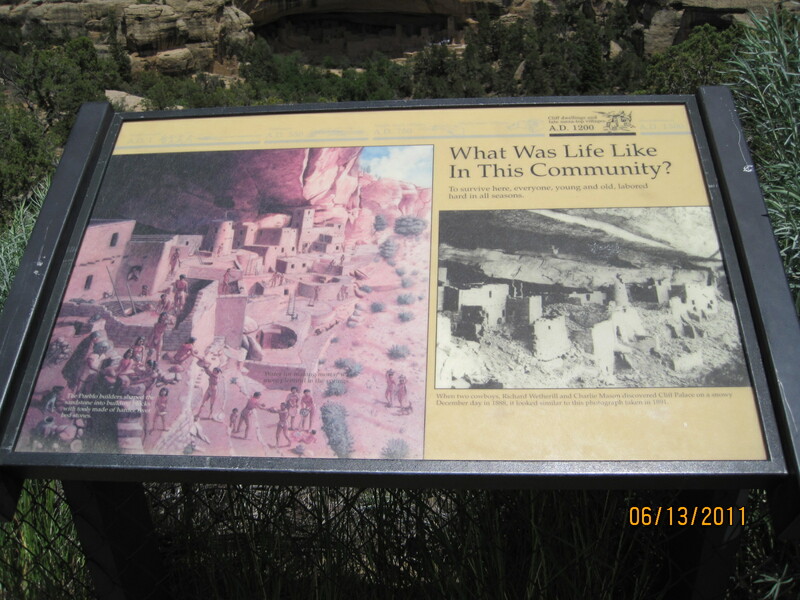 Mesa Verde Cliff Palace Sign - a multi-complex village. Mesa Verde Cliff Palace had several different sections on each side of this main village. 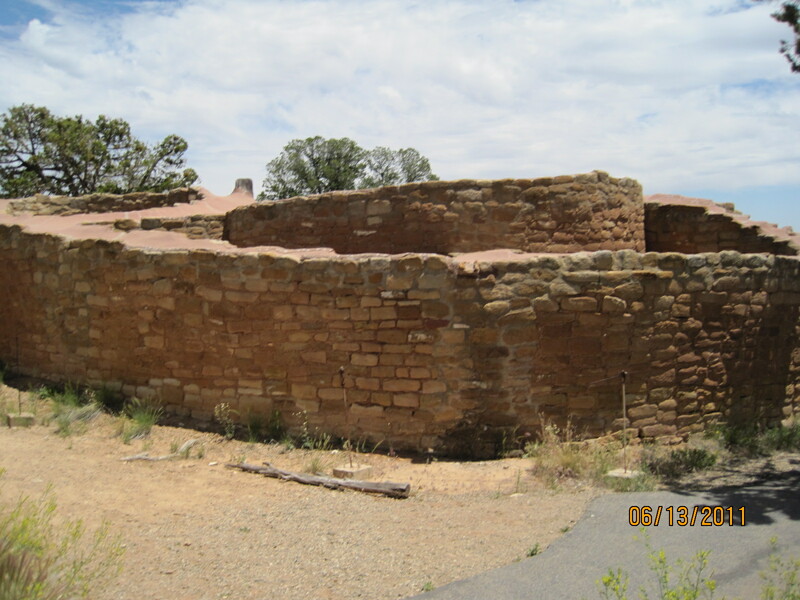 Today, we explored the Chapin Mesa Museum, Cliff Palace Loop (includes the two Ranger guided tours Ava took today: Cliff Palace [above] and Balcony House) and Mesa Top Loop. 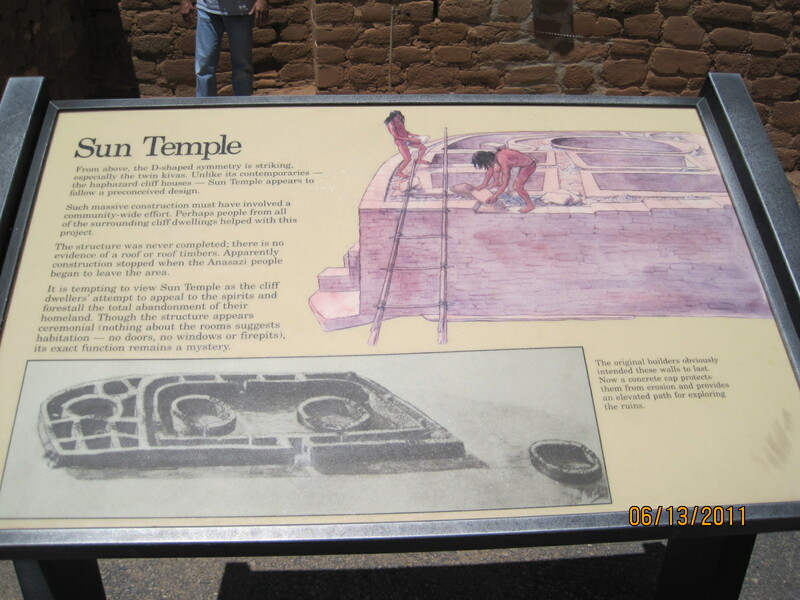 The most impressive part of Mesa Top Loop for me was Sun Point View and Sun Temple built around 1250 AD. 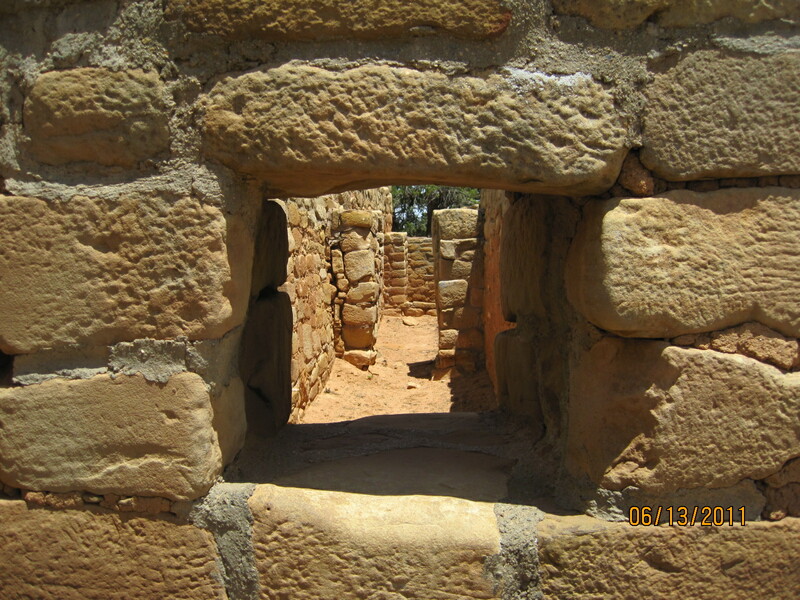 Sun Temple community had several "out" structures on each side of this main "village". There were so many of these communities in this one area that it was amazing. One right after another. 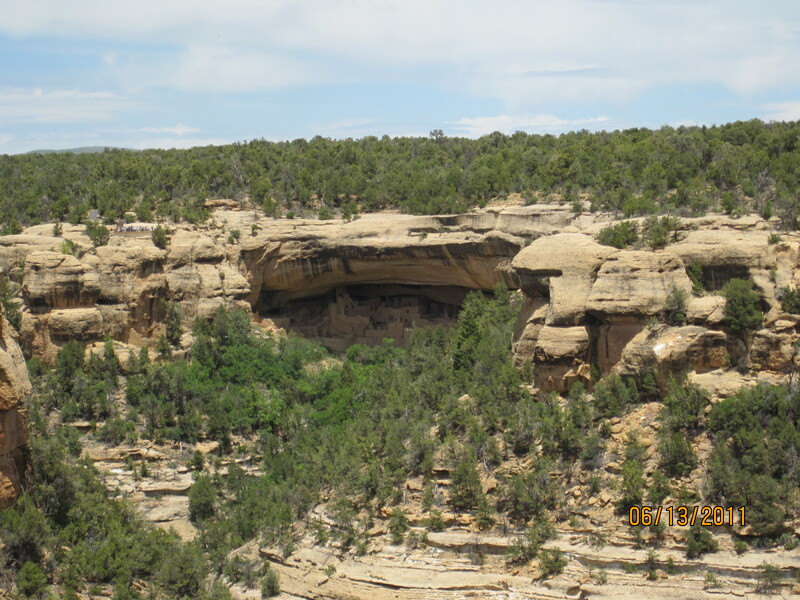 These Ancestral Puebloans (formerly called Anasazi) were the direct ancestors of the cliff dwellers in Canyon de Shelly and Monument Valley south of the Four Corners in Arizona. The last one we looked at was Spruce House. I have always been interested in the history of indigenous people of the Americas. A Shaman told Ava and I we had lived as Anasazi in a past life. Who knows. Maybe that’s why I’ve always been drawn to it. I’ve also been drawn to European history and South American history and Russian history and so on. It’s all good. Learning how our ancestors lived helps us be grounded. Go check out an indigenous people near you. 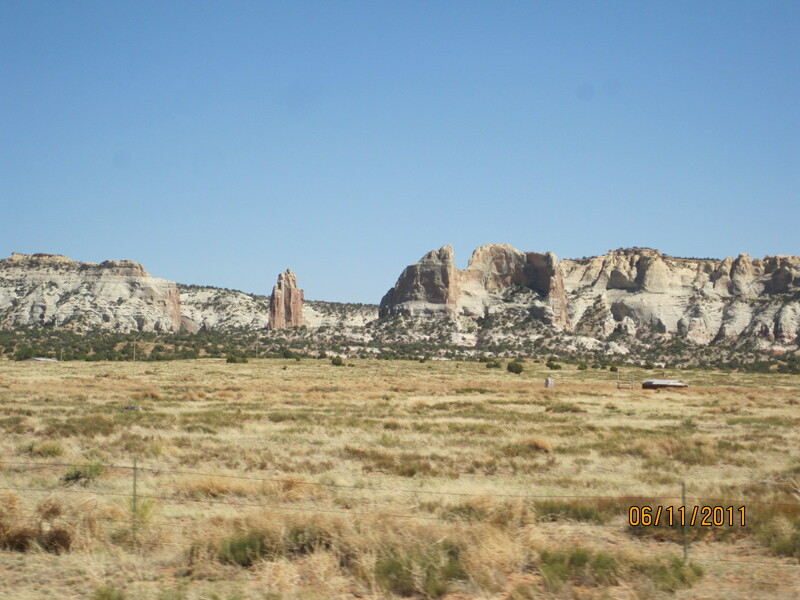 After getting well rested and fed at the Jacob Lake Inn, Ava and I were ready to hit the road toward the Four Corners area to hike Mesa Verde and check out Canyon of the Ancients. 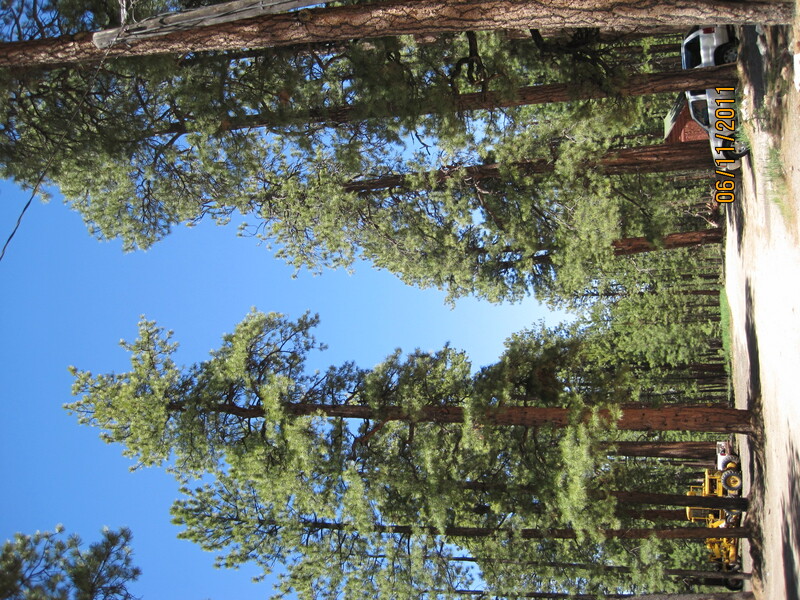 Oh, if you love hearing the wind blowing through the Georgia pines, you’re going to go CRAZY when you hear the wind blowing through the Ponderosa Pines. It sounds like the ocean. They’re so majestic. It will always be the back roads for me as much as possible. We took Hwy. 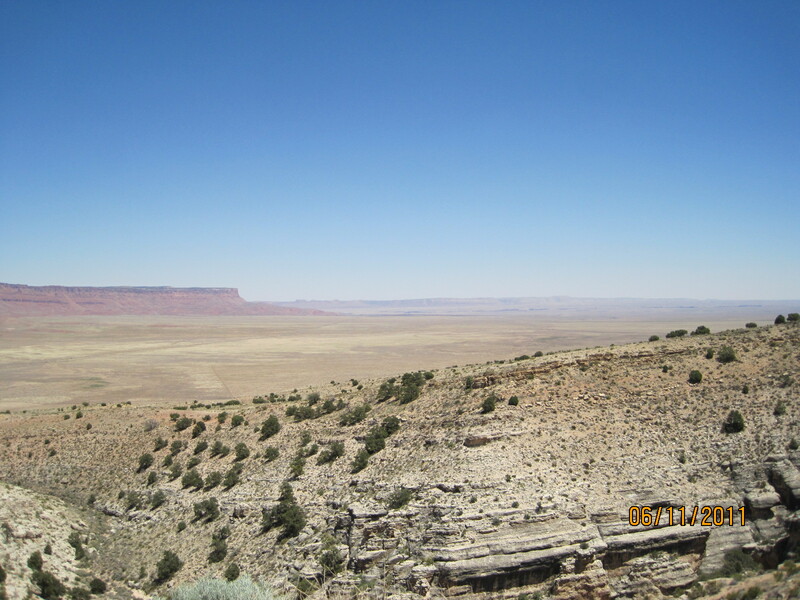 89 from Jacob Lake toward the South Rim of the Grand Canyon. 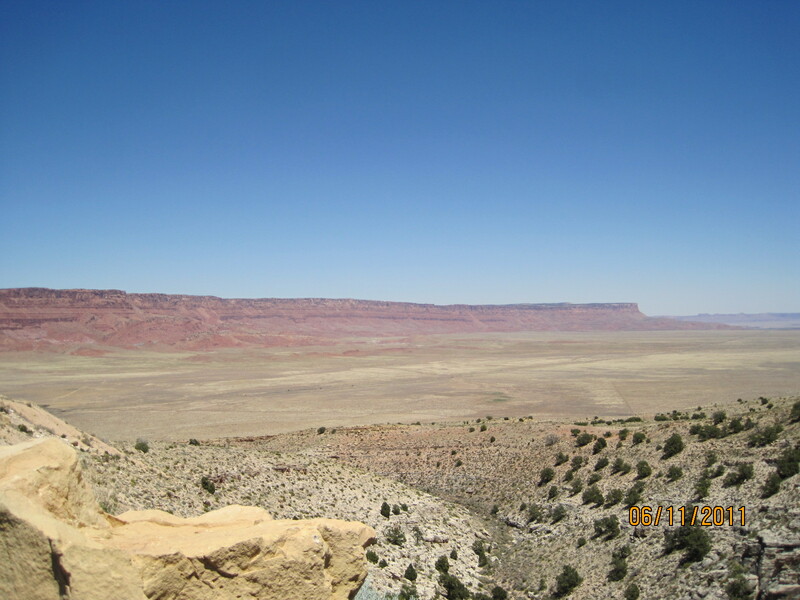 We were only into the trip about an hour when we came around a bend to see a dramatic topographic change. Ponderosa Pines and WHAM wide open spaces. It was such an absolutely breath-taking event going from dense forest to wide open spaces. 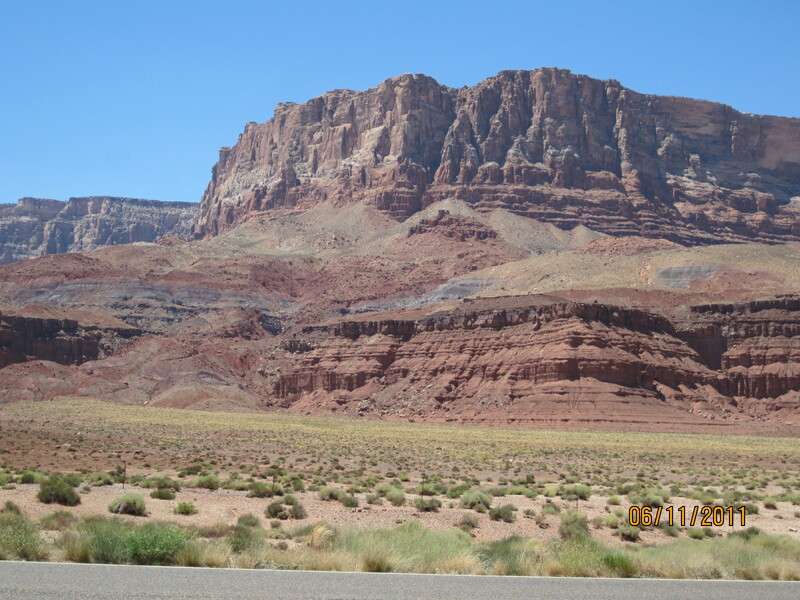 This is right before you get to the Colorado River so this is a part of the pre-Grand Canyon! 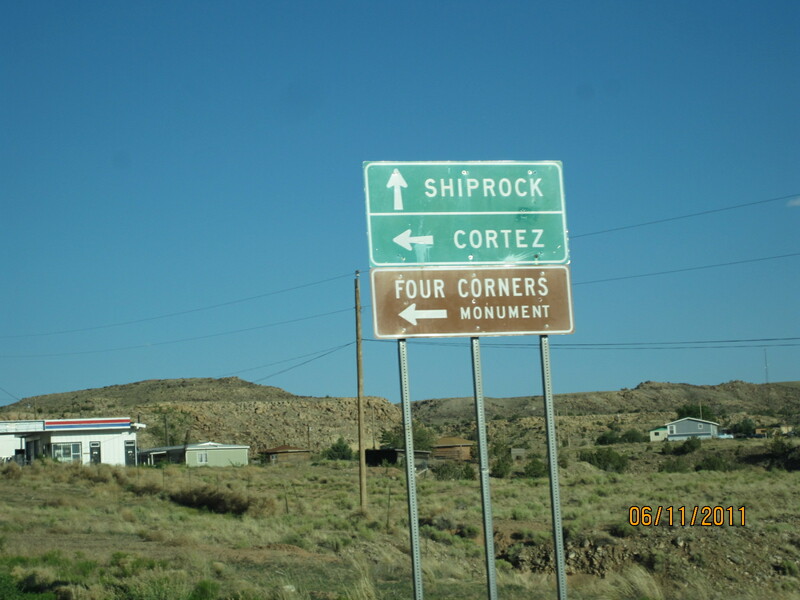 The color of the rock formations changes as you travel toward Hwy. 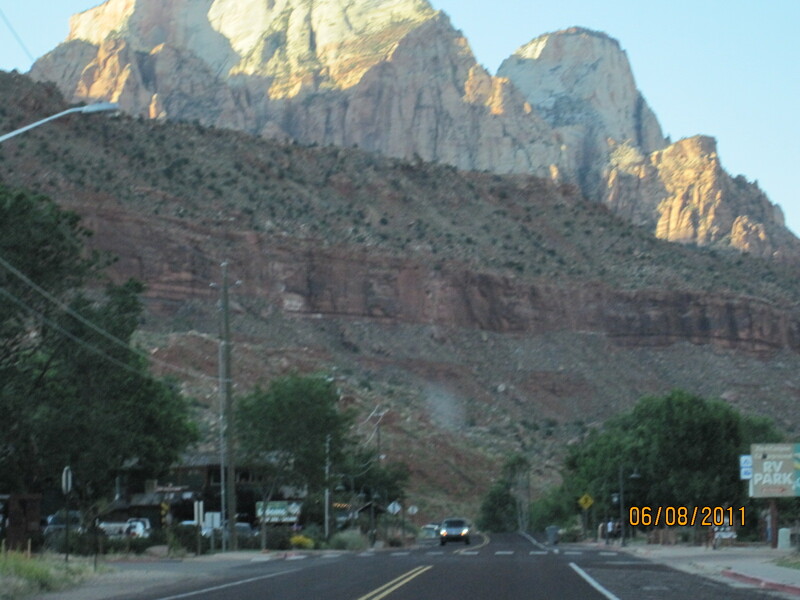 160 past Cliff Dwellers (the town). We climbed up Hwy. 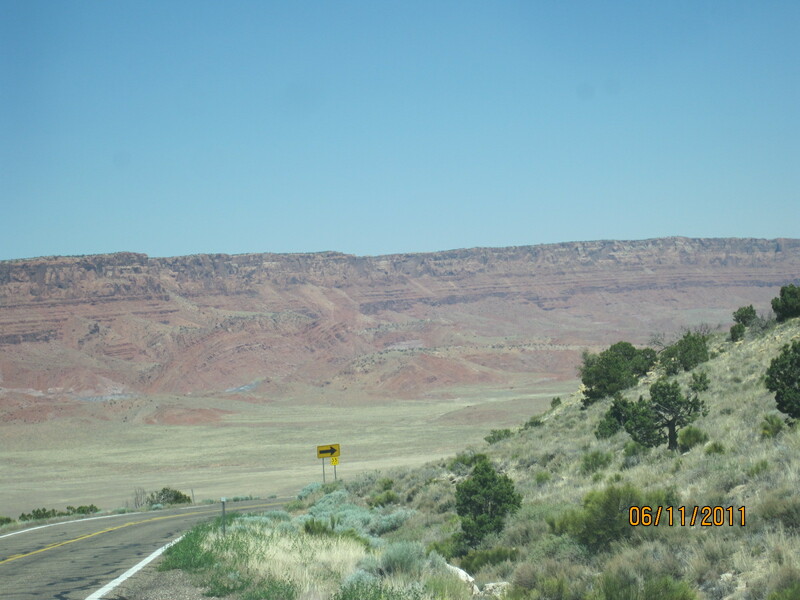 160 east toward the Four Corners area crossing flat, sand blowing highway through the Reservation. We passed pastures of Mustangs and not much else the whole time we were on Hwy. 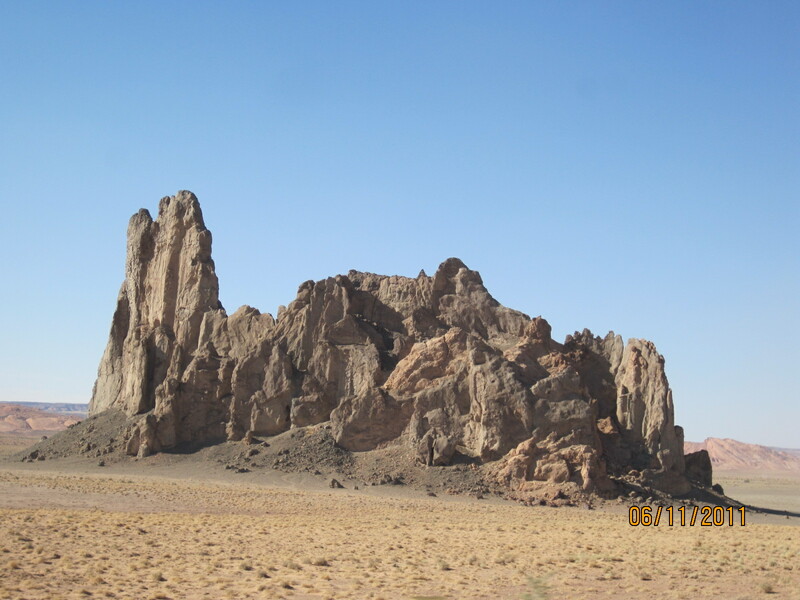 160 except for the occasional awesome rock formations left over from millions of years of erosion. 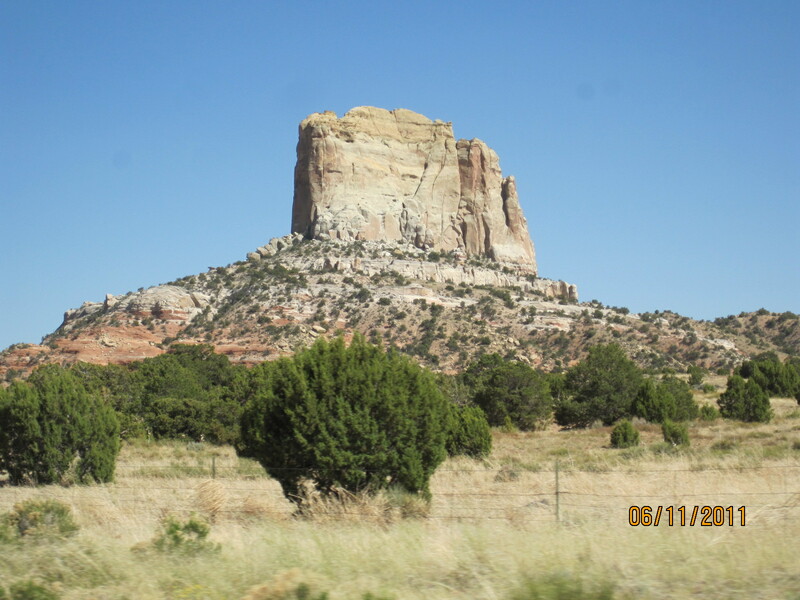 We decided this should be called "Castle Rock"
After driving 6 hours, we finally saw the turn-off sign for the Four Corners meaning we were only 10 miles or so from our campground near Mesa Verde. Yay! We made it! 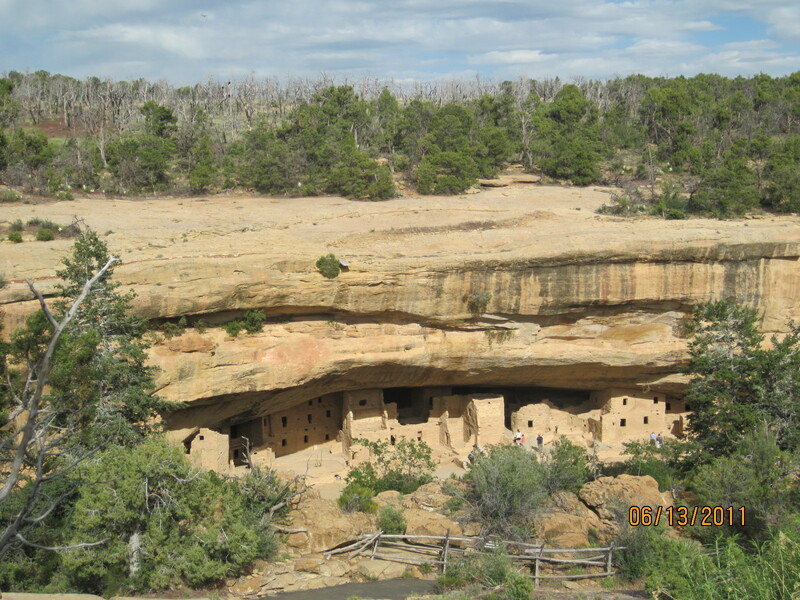 Tomorrow, Mesa Verde adventure. 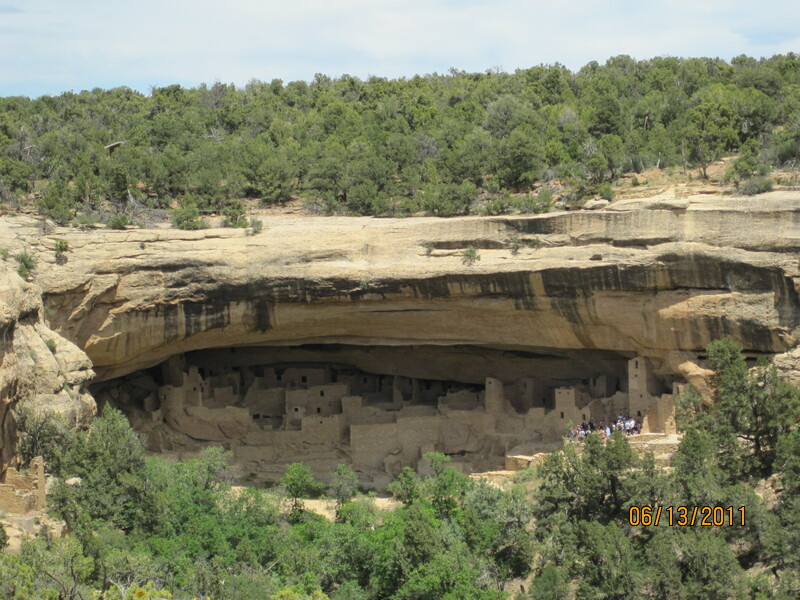 Ava will hike the Cliff Dwellers in Mesa Verde. After leaving Ava at the North Rim around 8:00 AM Friday 6/10/11, Montana (Crazy Lil’ White Dawg) and I drove up to the overlook to take some pictures. We chatted for about 15 minutes with a really nice man named Tom from Indiana after Montana tried to chase down a chipmunk over the over look. Time to leave! Where Montana jolted at overlook! We drove back to the Rip-off Campgrounds to write my blog, pack up and head for the South Rim but something was really bothering Montana after we’d left Ava. Montana is a very happy, puppy-like dog but, after leaving Ava, she wouldn’t eat or drink or play. At the pop-up, she kept going to Ava’s bed which she’s never done before. Also, something “whispered” to me to take my time doing what I needed to do and to not rush my process to leave so I didn’t. Woman’s intuition? Whatever it is, I’ve learned to “listen” to “it”. As I finished taking down the pop-up around noon-thirty, I noticed that a nut was missing off a relatively important bolt. I asked a man walking by me (assuming he worked at the campground) if he had access to any bolts that might fit the screw. He reached in his pocket and pulled out a nut saying he’d found it yesterday in the gravel drive. IT FIT! It was MY bolt. Wow. How cool was that? All morning, I prayed Ava would be encircled by Guardian Angels to protect and guide her on her journey and that we would have no problems in finding each other at her journey’s end. I left the campgrounds for the South Rim and was 30 minutes down the road when my phone rang. A man explained I didn’t know him but that he’d met Ava on the trail and that she was having problems with her knee; she was having to turn back. She’d now have to climb back up with a bad knee. As always, I called Mom for prayer reinforcements. It took me until about 2:30 to get back to the North Rim trailhead where cell service doesn’t exist. Thinking I’d hear more, I drove a mile or so up to the overlook armed with the knowledge from the caller that she probably wouldn’t be at the trailhead until 3:00 or 4:00. So, I figured I’d stay within cell service, pop-up the camper and get water, food and meds until 3’ish. As I drove to the overlook, I noticed a hiker dude walking in my direction who stuck out his thumb. I slammed on my brakes. He might have seen Ava. He tells me that he’s done this rim-to-rim hike for nine years and has never had anyone pick him up to take him that last mile until I did. Good feeling. I found a shady spot at the overlook area to pull over. I put Montana on her “chain gang” (connect her to a tree with a 20-foot cable) so I could open the pop-up. Right as I started the manual crank, the cable broke. I looked at it in full “stunned” silence before kicking into trying to figure out how to keep the now dangling cable from getting caught in tire hubs. Glad I had some pigtail bands. I rigged the cable up and prayed for more Guardian Angels. Crazies. 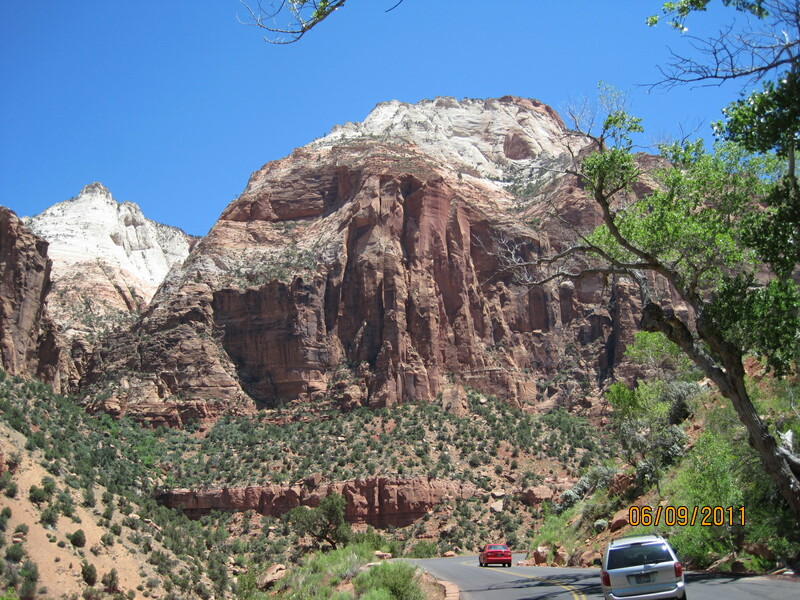 At 3:00, I drove to the trailhead and started asking every hiker coming up the trail if they’d seen my daughter. As there were many foreigners, I got looks of “huh?” but very nice ones, I might add. No one had seen her. Finally a Forest Ranger pulled up and parked. Good sign. I asked him if he’d heard anything about my daughter; he answered he was there to pick up Sandy, a nurse volunteer who’d been recruited to assess Ava’s condition and escorted her back up. They should be arriving fairly soon. Montana and I posted ourselves at the rock stairs at the trailhead so Ava could see us as she hiked the last few feet. Suddenly, Montana started twitching her nose in recognition of a familiar smell. I asked her, “Is it Ava?” and she started wagging her tail like crazy. Montana knew Ava was on her way and so did I.
Sandy appeared at the trailhead alone (heart dropped) and immediately headed over to talk with the Ranger. It took me 1 second to cross 20 feet to their side. Sandy assured me Ava was okay and about 100 yards down the trail. She dropped her gear, called over her shoulder as she trotted back down the trail that Ava would need to know I was waiting for her. Apparently, Ava worried the whole time coming back that I was already at the South Rim. Not only had Ava suffered a knee injury but she’d started having heat exhaustion as well. She’d finished about 1-1/2 gallons of water and had eaten but knew the signs as she’s suffered from it since she was a young teen. Ava hadn’t “heard” the Guardian Angels had already been working hard all morning long for struggling to keep her wits about her during the climb back. The next person I see was Tom from Indiana, the man I’d met earlier in the morning at the overlook. He had carried Ava’s backpack up the trail! I don’t think he realized until that moment he was helping my daughter! You help a stranger and you just don’t know how paying it forward will come back to you and yours. Guardian Angels. Donna and Gary Brown came up and hugged me telling me their part in Ava’s journey back up the canyon. They stayed by her side all the way back. Gary told me they’d already saved a woman from drowning at the beginning of their trip. What lovely Guardian Angels they are. It was during those terrible, pregnant minutes waiting for Ava’s arrival to the top that I told the Ranger about the cable breaking on my pop-up. After all, he had to live around the area and know of a shade-tree mechanic who could hook up a cable. He directed me to go try the Chevron station next to Jacob Lake Inn (www.jacoblake.com 928-643-7232). After the hugs and tears, Ava and I headed straight for the Chevron. We agreed we should check out the Inn for a place for the night. Ava went to do that while I talked with someone at the Chevron where I’d filled-up earlier that day. I’d already met Daniel at the Chevron. He’d offered to fill up my truck twice before as a service. Gratis. I sure momentarily confused by the gesture but pleased to see an old tradition. I was delighted when I saw Daniel and his co-w0rker, Steven, ready and willing to help in any way they needed to do just because they’re that kinda’ peeps. Guardian Angels. Although they’re young and didn’t know what to do in this circumstance, they were delighted to follow my direction in the repair. It was during this arduous but simple task that I explained how I was “mechanical” by nature and had watched my brothers work on their cars as a little kid. But, I continued, it was during my divorce from Ava’s dad that I refurbished a 1963 Falcon Futura convertible my mom said looked like it needed a crusher instead of an overhaul. I did body work with a sledge-hammer and a 2″x2″. Daniel and Steven worked tirelessly and in strange contorted positions fixing the cable. All three of us were greased up, filthy but happy when the pop-up worked. Guardian Angles. Ava had taken Montana to our cabin while all this was going on so she could shower and rest. Feeling somewhat better, we decided to eat at the lunch counter at the inn, where we met Brooke. She wanted to know all about Ava’s adventure and treated us like royalty. It was over our meal (try the “Grand Bull”) that we looked at pictures from her hike and glowed in the company of “family”. We love this little place in the crossroads of Americana. We just don’t like the campgrounds a quarter of a mile away! Funny thing is, Gary and Donna had checked that same facility out and rejected it. I meant to ask them where they ended up staying as all other camp facilities close-by were “dry” (meaning there are no utilities) and the ones within the park have been booked a year out. Really. Who knows what they want to do a year from now or where they want to do it? Funny thing about Jacob Lake. There is no lake. Apparently, the man who owned what I understand to be more of a pond-sized lake wanted to make it bigger for fishing. When he dug out the hole, he hit limestone and the whole “lake” flushed like a toilet! The water left is a puddle. A BIG “THANK YOU” TO OUR GUARDIAN ANGELS! It was cool hiking some small trails yesterday but today was the BOMB! I just LOVE driving through the park. As a rock hound, I’m in total hog heaven. The rock formations are remarkable combinations from billions of years ago with that many years of rain, wind, sand and Lord only knows what else attacking the surface to expose what we see today. There are layers and layers of frozen-in-time waves of red mud thrown in several different directions all frozen in a moment in time. 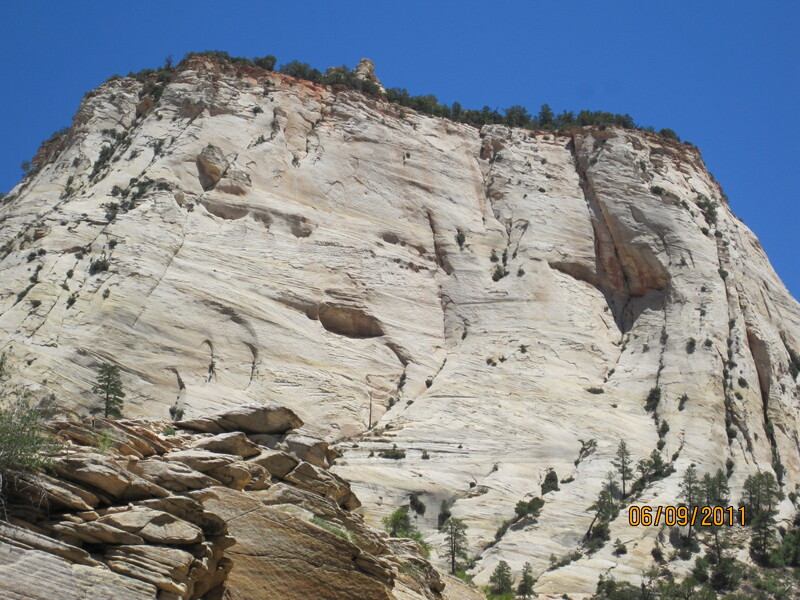 Zion's form of barrier to keep you from going over ... what... that 10,000 foot cliff? The red is the same red of Georgia clay used for making old bricks for 200 years ago. 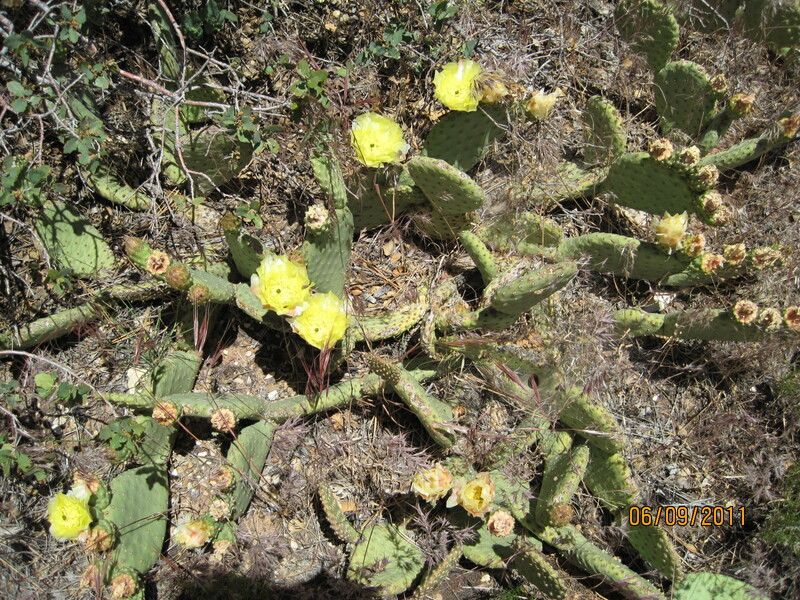 Add to that red, splashes of very white, chalky looking rock and lots of dark green pion pine needles and reddish-brown bark, light green cacti with yellow or sometimes bright pink blooms. 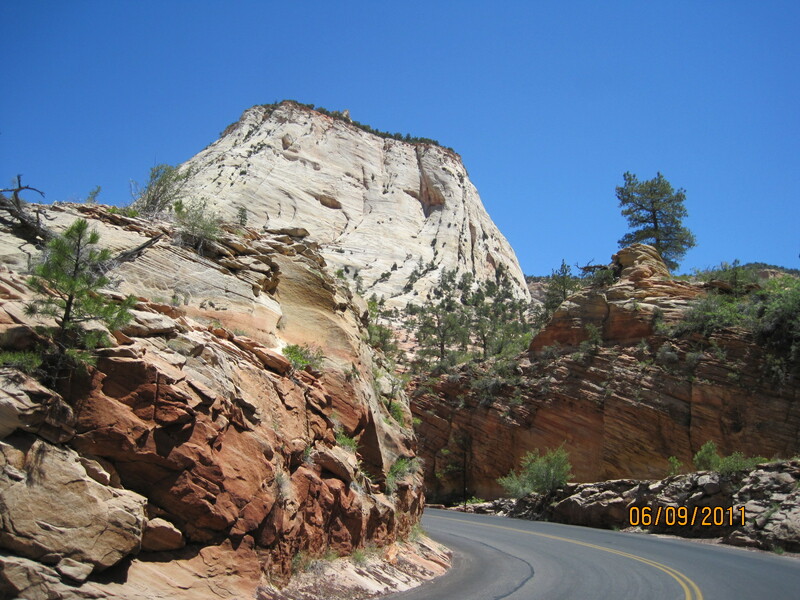 Sprinkled across this landscape are tiny lavender bell-shaped wild flowers along the side of the road or bright red flowers creeping out of the rock formations. We drove about 15 MPH and took over two hours driving about 40 miles. Normally, I’d do that in 30 minutes! Tells it all, don’t it! 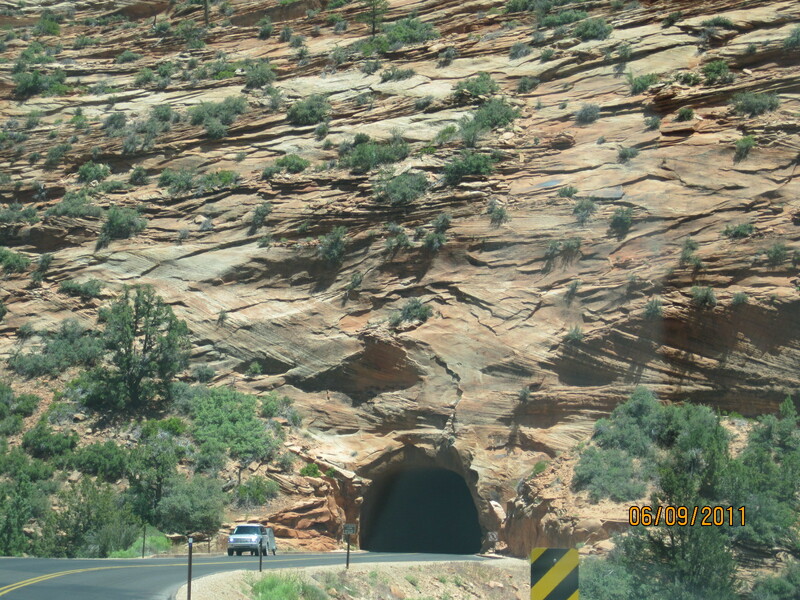 After driving up the mountain you reach the part where you go through the mile long tunnel. It’s so cool but the jerk kid in front of us threw out a cherry bomb in the tunnel and scared the crap outta’ us. Needless to say, when we exited said tunnel, I reported it complete with truck description and license tag number to the Forest Ranger holding the oncoming traffic as only one lane is open at a time. Saw the truck pulled over with a Ranger looking for the culprits. Like that! Now we’re on our way back out of the park exiting to the east so that we can end up at the North Rim of the Grand Canyon, hopefully, before too late so we can get a place to stay. This is where we stopped because we saw a waterfall, such as it is. The only one during the whole trip. 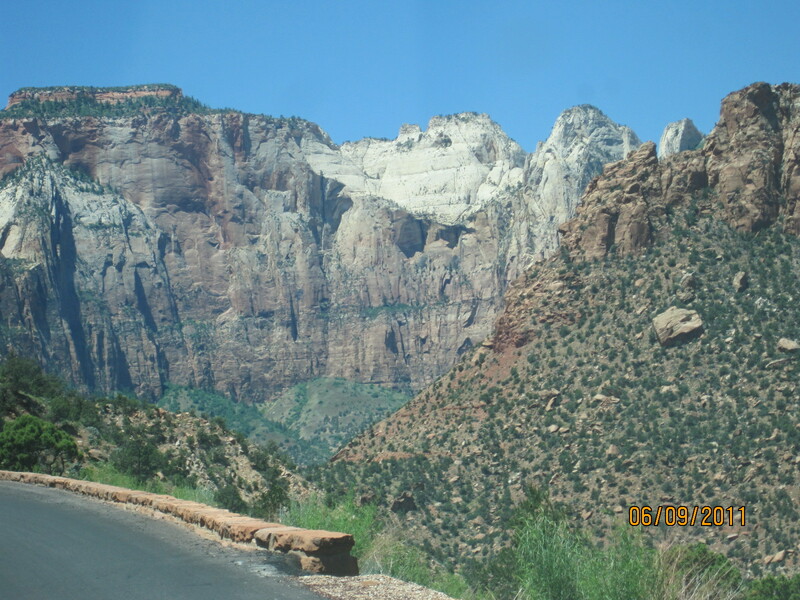 This next picture was so amazing because of the rock formations but if you look closely at the very top of the white mountain, there are rocks stacked on top of each other. Can you see the rocks stacked on top of the white mountain? Here’s a better picture of the stacked rocks on top of that white mountain with my zoom. So, after all this excitement, we realized that we needed to hustle up to get a place to stay. 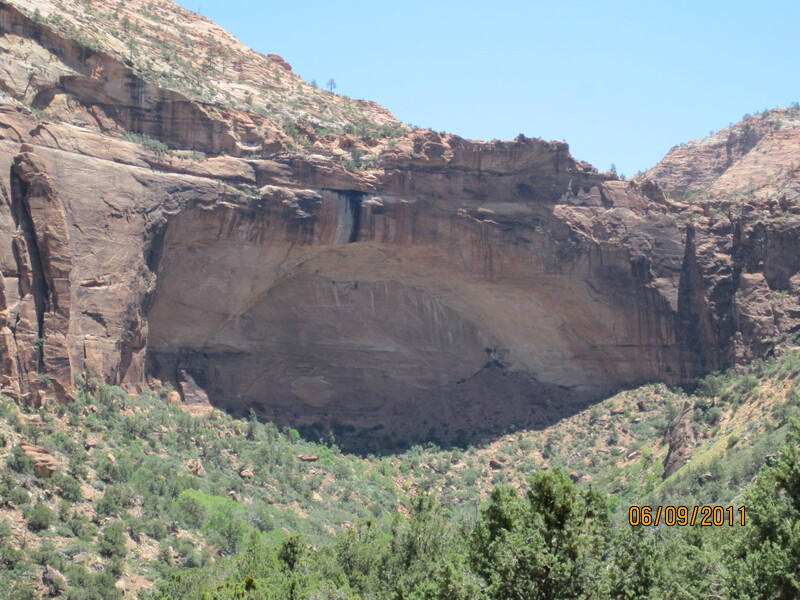 As Ava wanted to hike down into the Canyon and stay at Phantom Ranch tomorrow and hike back out the South Rim the following day, we needed a place near the North Rim. We were hoping against hope that there would be room in the park. No such luck. They book a year out. We found a place 43 miles from the North Rim. 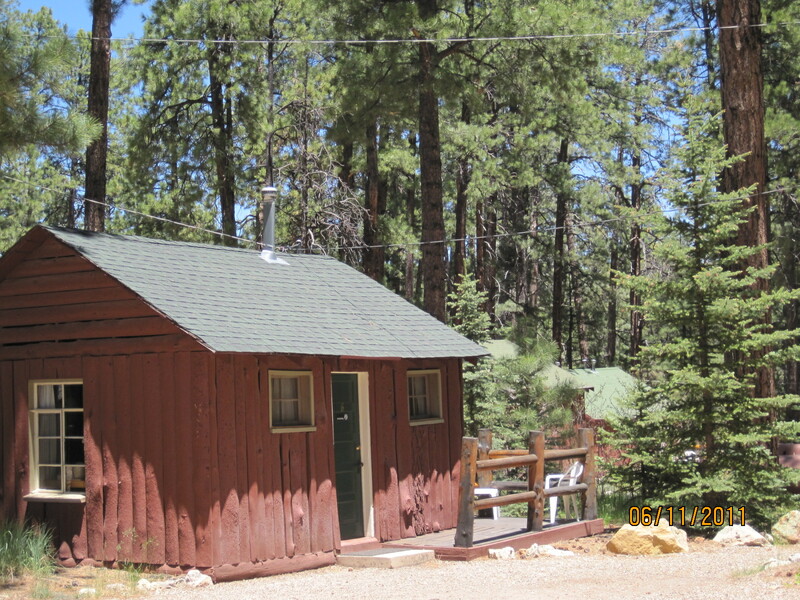 It is officially called Kaibab Campgrounds at Jacob Lake (or a similar name) which we now call Rip Off Campground. We’re so mad for so many reasons but first the cool part. We set up camp around 5:30 PM and drove immediately to the North Rim so Ava could find out specific details about her hike for the next day. We were confident that the only challenge after returning to camp was to not be excited in anticipation of her adventure… that apple don’t fall far from the tree. I walked a different path (vertigo, ya’ know) while she headed toward the Lodge and inquired as to availability for dinner. They had just had a cancellation so we could get a table on the RIM eating fine food, drinking fine wine while watching the sunset go down over the North Rim. Ava looked at me and said seriously, “Ya’ know this is the only place you can see the sunset over the Grand Canyon.” I believed her. And it was. Now back to the rip off campground. First of all they charge me with my little pop-up $37.00 plus tax which is the same as they do for huge 40 foot RV’s! No discounts. This has been a thorn in my side for the last three trips but now that these places are going up every year, it’s really ticking me off. The worst part? They have the NERVE to charge me $2.25 (in quarters only) to take a FIVE minute shower in a 2’x2′ shower stall! My little pop-up uses almost no electricity and we certainly don’t have toilets or running water like the RV’s. When I get home, I’m writing every congressman and woman about the problems with the cost of camping. How can it cost as much as a Motel 6 for crying out loud! There, at least I get a warm bed and a shower for about the same price! There’s some gouging going on and I’m either upgrading my pop-up to include toilet, shower and big screen TV or selling it and going back to Motel 6 like I had to do in 2009. What’s wrong with this state of the union when camping use to be affordable? I worked 45 years to live this dream of camping my way across this country. It’s been my dream, darn-it. Up early to take Ava back to the North Rim to hike while I tear down camp and drive to some new unknown campground at the South Rim Friday! The challenge is that neither of our cell phone service providers have great service here but I don’t doubt that she’ll find me! We stayed up so late last night trying to get ready to leave town that we couldn’t get up. What do you do? You embrace it. 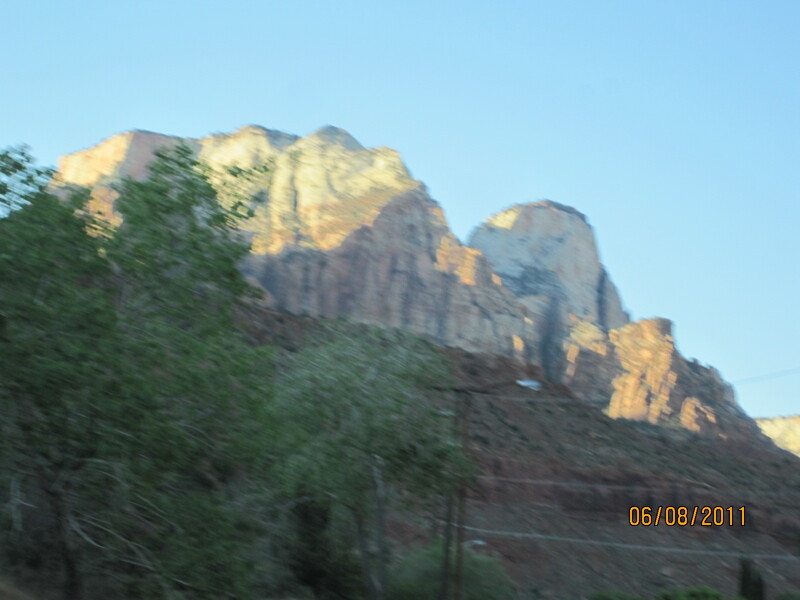 I figured we’d get to a campground early enough anyway to see some of Zion and I was right (Thanks God). You just have to get in before 4:00 and we barely made it with time change and driving but we did and that’s all that counts. Unfortunately, Zion isn’t all that pet friendly. There’s only one trail where dogs are allowed so I hiked that with Montana while my daughter took the shuttle up to the stop for hiking Emerald Pool. She says it’s gorgeous. I hope to find out tomorrow while she dog sits Montana. Right now, all I want to do tomorrow is take the Shuttle all the way to the top and back just for kicks and giggles. 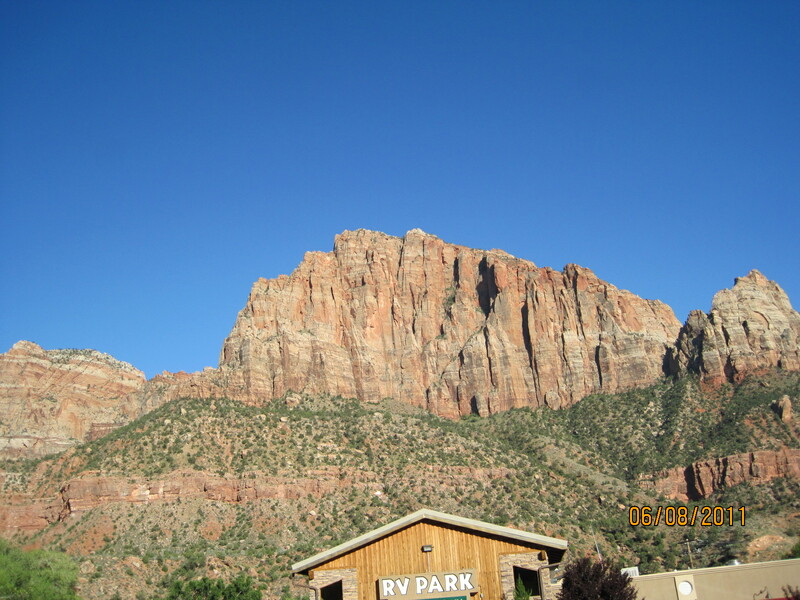 Our facilities are expensive at Zion Canyon Campground RV Resort at $35.00/night seeing as how it’s we’re renting is the dirt and a little power. They charge the pop-up campers the same as the huge RV’s. That ain’t right. I don’t even have water hook-up here. The internet connection is lousy. To top it all off, the overhead lights in the pop-up decided not to work tonight. The good news is the Virgin River is roaring outside and will lull us to sleep. Now this is what I call a room with a view! The other good news is that there is an amazing view outside our pop-up. Wow. 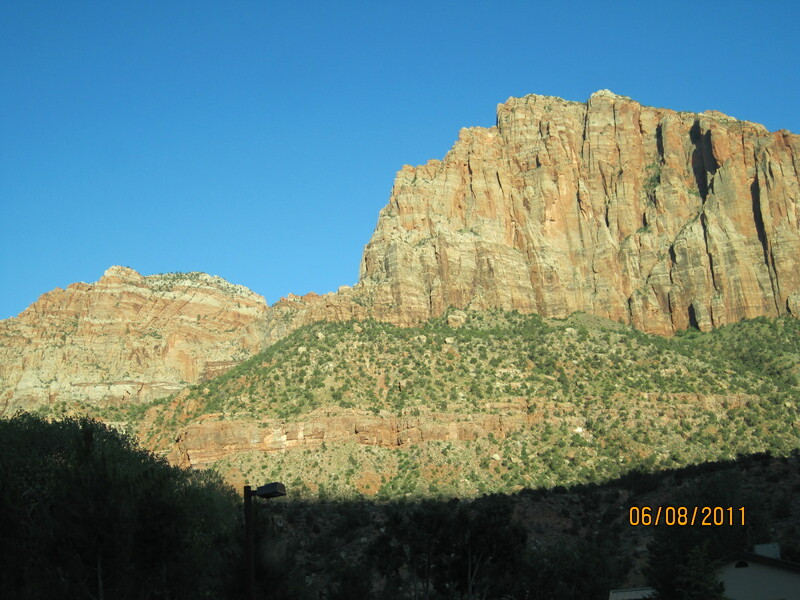 I can’t wait to drive over the mountain to the North Rim of the Grand Canyon tomorrow. 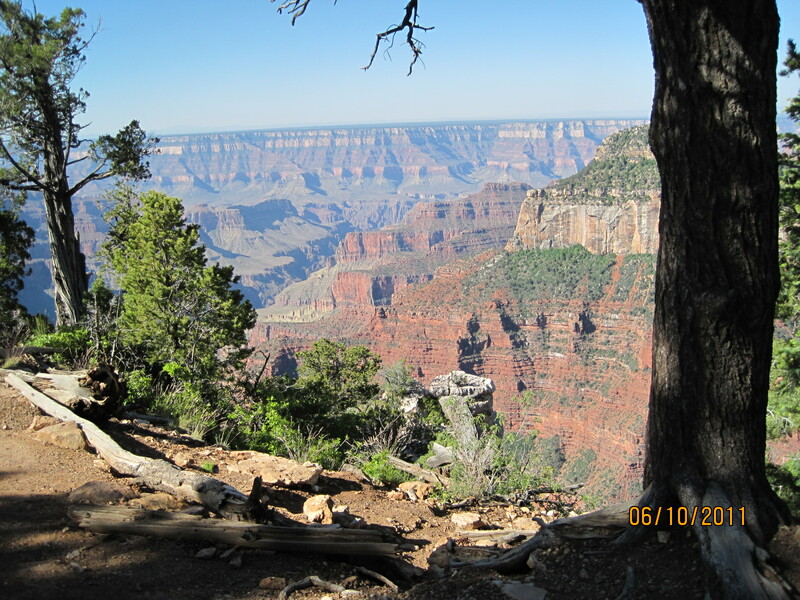 So, more installments tomorrow from the North Rim. I’m so excited. I’ve never been there before and it’s all back scenic roads getting there. Oh boy!